I have pulled together some fabric pieces that I think may combine nicely to make my first quilt. While I pledged to make my first quilt on an earlier post, I did not pledge to make a large quilt--just something larger in proportion to a potholder....It will, however, have to be large enough to call a quilt! a few quilting projects under my belt. There are plenty of wonderful quilting blogs out there in BLOGLAND so I will respectfully defer to them. WISH ME LUCK! Repurpose a curtain panel into a kitchen apron! 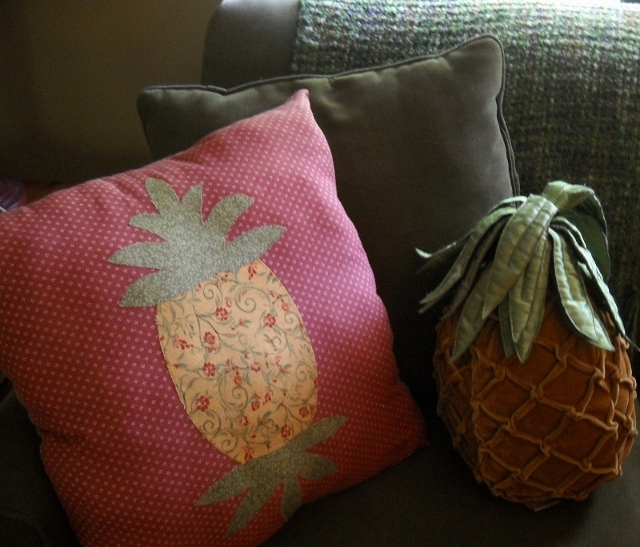 If you have been following the past few posts in my blog you know that I recycled a pair of rust kitchen curtain panels into a pineapple pillow. I used some leftover scraps and other fabric scraps to make the scrappy heartstrings and with an entire panel still left, I will be making a kitchen apron. Honestly, I am getting a little weary with regard to this fabric but I am determined not to waste this perfectly useful piece of cloth. I apologize if you are regularly reading my blog and also growing tired of this fabric. I promise it will be the last time you see it in my sewing projects! If this is your first visit to my blog, I won't make you go back to find my older posts. Below I have included photos of the pillow and the hearts cut from the first panel of curtains that I repurposed. I have only begun wearing an apron while cooking in recent years. I had had my fill of grease or spaghetti sauce spattering and ruining my work clothes. I had always come home in a hurry from work and had to be ready to get one kid or another somewhere else so I rarely had time to change my clothes before preparing the evening's meal. I don't know why I did not use an apron. Seems like a no brainer to me now. One Sunday afternoon I decided to make myself an apron out of some leftover curtain fabric and now I try to use it when I am cooking something that spatters and when I am grilling or cooking for company. They are quick and easy to make. I have also made these as gifts. Add a couple of coordinating potholders, kitchen towels and fill the pockets with some kitchen gadgets and you have the makings of a fine bridal shower gift! Original apron I used for a pattern. I made this a couple of years ago. At the bottom of the curtain panel is a wide hem. I cut that off and cut it in half. I will use these two pieces as the ties at the waist. See photos below. Trimming excess off the bottom hem. By utilizing every piece of the curtain, a lot of the work is already done for you. Cut two matching pieces for any type of pocket you desire to be on the front. I am doing one large center pocket rather than the two pockets on the original apron pictured at the beginning. With right sides of fabric together stitch around the entire pocket leaving enough of an opening to turn right side out. Then stitch the opening closed. Press and top stitch the top of the pocket. Place on the front piece of the apron making sure it is centered. Take into consideration that there will be a seam allowance involved when the two apron pieces are finally stitched together. Then stitch to the apron on the two sides and bottom of the pocket. rod pocket together lengthwise, press and stitch with a zig zag. Trim any loose edges and threads. Decide which side of the neckstrap you would like to show, then pin right sides, raw edges together to the top of the apron. Make sure to place each strap 1/2" inside (the seam allowance) so when the apron pieces are sewn together, the strap does not get sewn into the seam allowance. Baste straps in place. At this point we will proceed with the side ties using the wide hem of the curtain that has been cut in half vertically in an earlier step. Fold each tie in half vertically again and iron. Then stitch with a zig zag. Repeat for second strap. Press both again and cut off any loose threads.. Baste both ties in place. ***NOTE: Remember to allow for the seam allowance as we did in the pinning of the neckstrap. Place all straps inside as you place the back piece (lining) of the apron on top of the apron front--right sides together and pin. Sew all around the sides of the apron and leave an opening either on the bottom or one side to turn the apron right side out. Whipstitch the opening closed. Turn right side out. You may topstitch all around the apron if you desire. Your apron made from recycled fabric is ready to wear. "FROM THE INDUSTRIAL REVOLUTION THROUGH THE GREAT DEPRESSION, AN APRON WAS A MANTLE OF RESPONSIBILITY WORN PROUDLY BY DEDICATED WOMEN: QUIET STATEMENTS REGARDING A WOMAN'S PRIDE IN HER HOME, HER WORK, AND CERTAINLY, HER APPEARANCE. IN THEIR VINTAGE FABRICS AND DELICATE HAND STITCHING, APRONS BECAME TANGIBLE SWATCHES OF OUR SOCIAL FABRIC, GENTLE COTTON REMINDERS OF THE PAST.